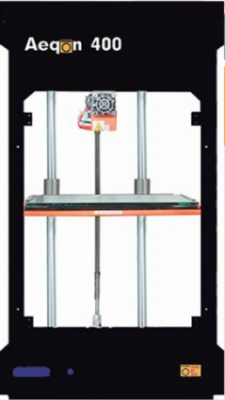 India’s first extended Z-axis single extruder 3D printer with a tall body design for easy 3D printing of taller objects. Divide By Zero’s Aeqon 400 is a uniquely designed single extruder 3D printer, which sports a build volume of 300mm × 250mm × 400mm with an extended Z-axis. This unique build volume allows the users to easily print objects whose design demands an added vertical headroom. Enclosed in a high-endurance sheet metal tall body, the Aeqon 400 is pre-assembled, calibrated and tested for quick 3D printing right out of the box. Aeqon 400’s low-noise operation, quick-load functionality, super-fast slicer and industrial-grade build quality ensure reliable print-cycles. With specially design high precision ball screws gantry along with print speed upto 200mm/sec, this 3D printer delivers unmatched precision and repeatability - a prerequisite in rapid prototyping and low-volume batch manufacturing. Superior features like SD card, USB and Wi-Fi allow seamless connectivity and the built-in camera allows remote monitoring of print batches. With a unique build volume and an easy-to-use interface, the Aeqon 400 is an ideal prototyping machine for packaging and product development applications. Scale new heights in your design and develop unique products with maximum precision and minimum turnaround time.